Do stones and boulders used for climbing need a use zone? Larger stones and boulders can be used as a kind of climbing equipment. Climbing stones more than 18 inches above the ground surface should meet standard use zone and safety surface requirements. The depth of the use zone material should correspond to the maximum fall height of the boulder, as with traditional manufactured equipment. When used in a grouping, the climbing stones should be six feet from one another, any other piece of equipment or solid object. Set into the ground to ensure its stability and to prevent entrapment hazards between the stone and the ground. Heavy enough that a single preschool child cannot pick them up. Placed intentionally in settings, not simply scattered randomly throughout the site. 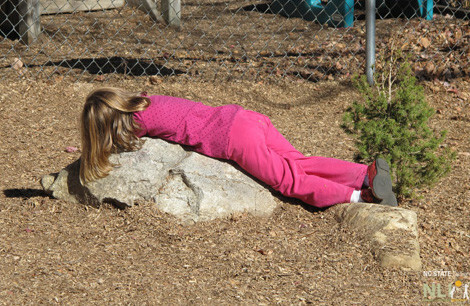 A girl rests in the sun on a large stone. 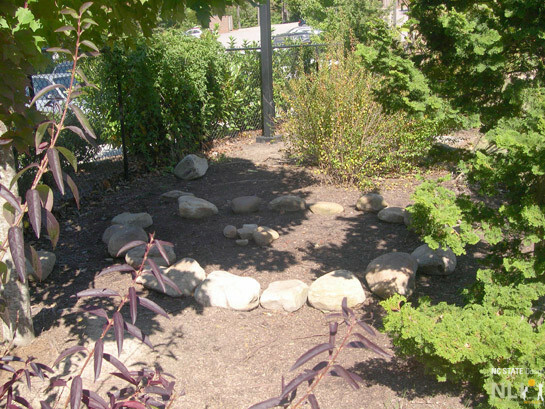 A stone circle provides a gathering space.